Today’s Atelier d’Écriture class was relatively concise. It seems to be that when you’re not sure what kind of preposition to use, à is usually a good bet. How would you say “I’m going to buy a bike for my brother?” Most of us wrote this as Je vais acheter un vélo pour mon frère. Wrong. Although pour is the right translation for “for,” it’s not what you’re supposed to say in French. Switch that to an à, and you’re good. To put that in pronoun form, you say Je vais lui acheter un vélo. What about “I’m going to buy a bike from my neighbor?” That becomes Je vais acheter un vélo à mon voisin. (not de mon voisin, that doesn’t exist) Remember that à… and in pronoun form, it’s Je vais lui acheter un vélo. Hold the phone, that looks similar to the first phrase, and it looks exactly the same as the phrase with the pronoun before! Silly French people, how do you get around that? French people automatically give a small explanation after the phrase to say if they’re buying something for or from someone (in our language), so keep that in mind. Let’s keep going with this. What about “I’m going to lend a bike to my best friend.” Je vais prêter un vélo à mon meilleur ami. When the verb changes a little and you end up with “to,” it still doesn’t matter, you’re still using à. With the pronoun: Je vais lui prêter un vélo. Last one: “I’m going to borrow a bike from my cousin.” Je vais emprunter un vélo à mon cousin. Going way back to the first sentence, despite the “from,” you’re still using à. With the pronoun: Je vais lui emprunter un vélo. There’s one exception to the “don’t use pour” rule. When you’re translating “I’m going to buy a bike from my neighbor for my brother,” that turns into Je vais acheter un vélo à mon voisin pour mon frère. The pour is only there to make that tiny clarification. Since we’ve been dealing with all of those pronouns, for clarification, the pronoun goes directly in front of your important verb. That’s your auxiliary verb if you’re using passé composé (Il lui a volé 50 euro! ), or the verb that your object is dealing with (whatever the bike was dealing with in this case). The rest of today’s lesson was on how to deal with “way.” How would you translate “He speaks in a strange way?” The problem here lies in the preposition we use. We get hung up on trying to actually say “in” which is dans, so our phrase usually is Il parle dans une façon (or une manière) étrange. This is incorrect. We should be using de instead of dans, so the phrase should read Il parle d’une façon étrange. If you’re ever writing something like this, you can drop the article to make it a little more elegant (de façon étrange). Keep in mind, that fancy twist doesn’t work when you have an adjectif antéposé (he speaks in a pretty way, il parle d’une belle façon). This phrase changes a little bit when you use it in a manner like “I like the way she sings.” You still need to remember to use the de, but because you’re dealing with a relative pronoun, it turns into dont. J’aime le façon dont elle chante. What about “Young people want to live their own way?” Revert back to the earlier trick for this one. Les jeunes veulent vivre à leur façon. Why do we use à here? It’s possessive! If you’re making something “in the style of Julia Child” (for example), you’d use the expression à la façon de quelqu’un. One last random thing, if you ever want to add a little elegant flair to your speech, and you’re speaking in the negative, use a little inversion. In the case of saying “couldn’t you” you’d normally say it ne tu pourras pas, but it’s more elegant if you say ne pourras-tu pas. The cheese (fromage à raclette) goes in the tiny pans under an electric broiler, and you put the potatoes on the grill range to heat them up. Once the cheese is melted, you put the warm potatoes on your plate, and put the melted cheese on top, then you eat it with your ham and your salad. 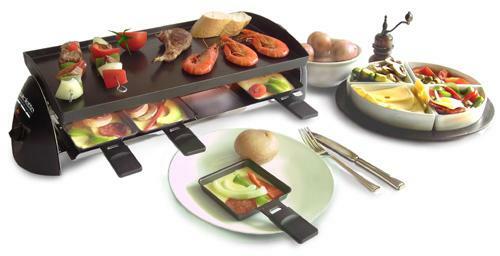 I think I can recreate this without buying a raclette machine back home. There’s no room for such things in a tiny, college-student kitchen (nor do I have the money to spend on such frivolity)… Oh my gosh, I think that topped the galettes du sarrasin… Sheila and I seriously had to roll away from the dinner table with giant smiles on our faces. Madame said she was going to be gone for the weekend again, so she left us some TV dinners in the freezer. There’s talk of having a dinner party at Joan’s since her host family is gone again (and they gave her permission to have friends over to cook), so I’m trying to figure out what to make. This entry was posted in Corneille, food, France, French Language, paris, raclette, theatre. Bookmark the permalink.